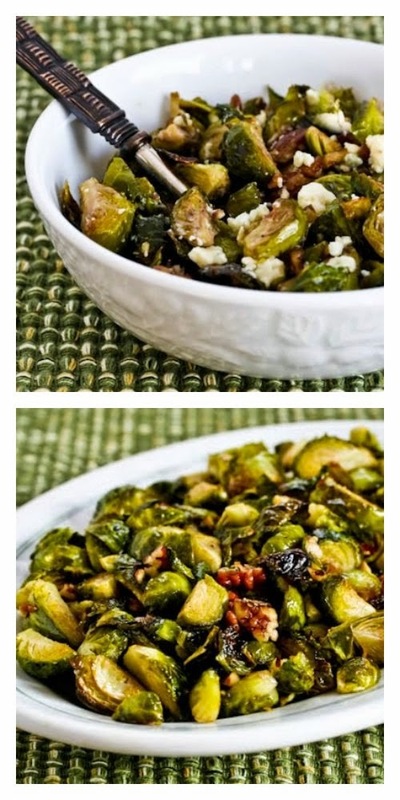 Roasted Brussels Sprouts with Pecans and Gorgonzola, wow! Or make them without the Gorgonzola if you prefer! The very best recipes of all are probably ones that people excitedly describe and urge their friends to try, and if that's true, then this recipe for Roasted Brussels Sprouts with Pecans must be doubly good. First my friend Trudy told me about the roasted brussels sprouts with pecans that were such a hit when she made them. Pecan Brussels Sprouts from The Blackberry Farm Cookbook were the ones Trudy made, and I found that recipe online and adapted it a little for the Roasted Brussels Sprouts with Pecans pictured above. Then, when I mentioned on Twitter that I was making them, Sean from Hedonia shared that he makes roasted brussels sprouts with hazelnuts, and always tosses the hot sprouts with a little bit of crumbled blue cheese, like the photo above. I loved the idea, so I tossed half the batch with some Gorgonzola cheese as Sean had suggested. Whether or not you're opting for the addition of blue cheese or Gorgonzola, this recipe is a keeper!